A dinosaur that used to kick animals that attacked it, has been discovered. This dinosaur was named Brontemorus Mcintoshi. There is a nick name for this animal as Thunder Thighs dinosaur. It got that name just because of its huge bones in its thighs. It is well known that the scientists conduct excavations for dinosaur fossils. When digging at Utah in 1994, two skeletons of huge dinosaur fossils were found. In the beginning nobody paid attention. In the year 2007, a scientists group that belonged to California, examined them. After three years of research, it is found that those two dinosaurs belonged to a new species. One skeleton was of the mother and the other was the child. It is estimated that Brontomerus Mcintoshi dinosaurs existed on earth before 11 crores of years. These weigh about six tons and their height was 46 feet. The dinosaurs were having a long neck and were vegetarians. Though many species of dinosaurs were discovered in the past, this is the first time to discover about the dinosaurs which kicked other animals. Scientists have come to conclusion that these dinosaurs were very strong by examining the arrangement of the bones in their thigh region. The scientists said that these dinosaurs used to kick other animals when other animals attacked them. The fight is just like the fight which is seen between the hens in the villages. 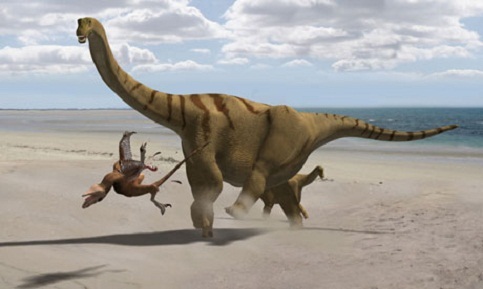 Brontomerus Mcintoshi dinosaurs used to kick other animals with their legs. This dinosaur used to kick other animals till they died or ran away from that place. On the other hand these Brontemorus Mcintoshi dinosaurs were angry and irritated, said by the scientists. « Black Tea for Weight Management	» Is It Possible To Run A Car By Using Air As Fuel?